Click Here to find out how to receive 2 for 1 on all qualified items purchased and for important information when using the online shopping cart to order MPS-GOLD® 3X. MPS GOLD 3X is supportive to MPS GOLD 100 and should not be taken independently. Where as MPS GOLD 100 contains a broad range of molecular weights, with each specific molecular weight range associated with a specific health benefit, MPS GOLD 3X contains a proprietary and narrow molecular weight range that is associated with supporting the T4 and Macrophage cells in the immune system. These molecular weights are considered Galactomannan Glyconutrients in the same way that the broad range of molecular weights in MPS GOLD 100 are also considered Glyconutrient Galactomannans. By taking MPS GOLD 3X along with MPS GOLD 100 support is given to its Acemannan component (the molecular weights of 1,000,000 to 5,000,000 Daltons) an additional boost is given to the immune system. In fact, the effect of MPS GOLD 3X increases the overall immune system effect by up to three times when taken with MPS GOLD 100. MPS GOLD 3X is extracted from Aloe Vera Gel as a loose powder and separated from the leaf and then dried with a proprietary process. 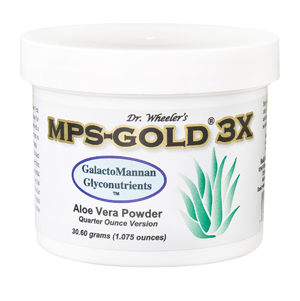 The powder extract from Aloe Vera in MPS GOLD 3X is stabilized to contain a proprietary molecular weight range that provides tremendous support to the immune system. Added to MPS GOLD 3X is larch tree powder that assists in the gut absorption of its very large Glycontrient Galactomanan molecules. Add MPS GOLD 3X as half the dose of MPS GOLD 100 in a cup or glass and mix with a small amount of water or juice, which creates a tasty and refreshing drink. Take once a day in the morning before eating or drinking anything else.